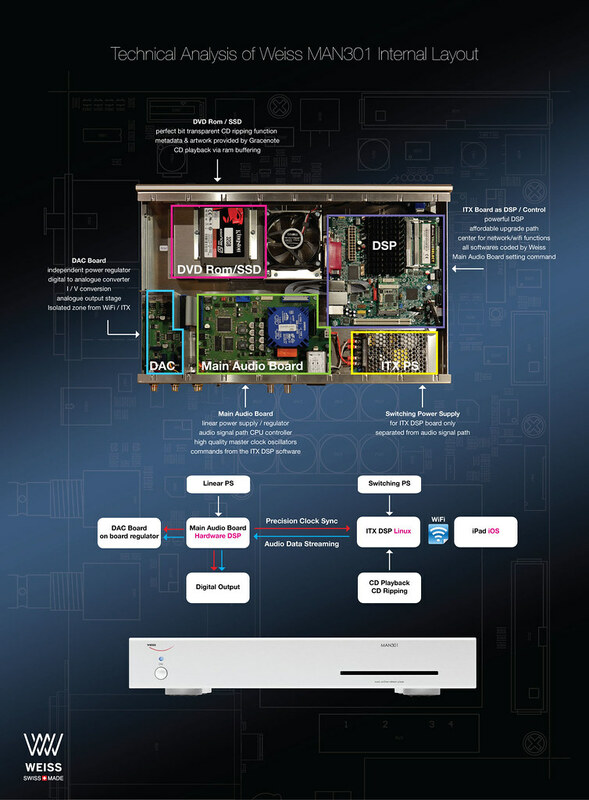 MAN301 is Weiss “ALL IN ONE” digital audio network server. Playback of music files stored on a hard-disk or via streaming from the Internet has arrived at the audiophile’s home. 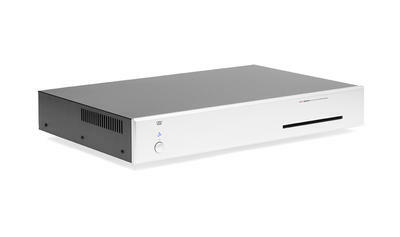 The MAN301 network player is a Powerhouse in terms of features, versatility and sonic quality. Using the professionally maintained Gracenote database for metadata and cover art fetching, the MAN301 has a big edge over competing devices. The MAN301 is an extremely versatile Music Archive manager and Network Player with an Apple® iPad remote control unit and e.g. a NAS type external storage medium. It is a system for music archiving, music library maintenance, music playback, CD ripping and playback, Internet radio streaming and more. A complete MAN301 system consists of: The MAN301 Base Station. An external NAS (Network Attached Storage) device, typically a hard disk or an array of harddisks. This allows for virtually unlimited storage space for music files. An iPad device with the Weiss MAN app for remote control of the Base Station. A means of accessing the Internet by the Base Station for fetching CD cover art, CD metadata or for streaming music. Mechanics The MAN301 uses a stainless steel chassis with a solid 10 mm aluminium front plate. Power Supply Two separate power supplies are employed, one for the computer section and another one for the digital and analog audio sections. The audio section power supply uses a toroidal transformer with a combination of switching and linear voltage regulators. The standby power is at a very low 0.5 W maximum. Synchronization An internal high precision / low jitter clock generator is responsible for clocking the audio section. The sampling frequency of that generator is switched automatically according to the sampling frequency of the track played. In addition there are word-clock input and output on BNC connectors for external synchronization purposes. All standard sampling frequencies up to 192 kHz as well as DSD64 and DSD128 are supported. Digital Inputs Digital inputs for external audio sources: AES/EBU or S/PDIF formats on XLR, RCA, TOSLINK. Converters Available with the DAC version of the MAN301: The built-in D/A converter is of similar design to our renowned DAC202 unit. It uses four D/A conversion channels per audio channel for extremely low noise and distortion and an excellent linearity. The SERVER type of the MAN301 (i.e. the version w/o DAC) can be (user-) updated with the D/A Converter module at any time. Analog Outputs Available with the DAC version of the MAN301: Analog outputs on XLR and RCA connectors. The basic output level of these outputs can be set in four coarse steps in the analog domain. In addition they can be fine trimmed in the digital domain. The main fader, finally, works in the digital domain as well. The quality of this level control scheme is extremely high due to the excellent linearity of the D/A Converter and due to the dithering applied to the digital signal. Digital Outputs Digital outputs to external D/A Converters: AES/EBU on XLR and RCA, Firewire, USB. The XLR and RCA connectors can be combined into a dual wire type output for sampling frequencies of 176.4 or 192 kHz. Front panel controls The power switch allows to switch on or off the MAN301 unit. A three-color LED indicates the current system state. The slot-in type drive takes up CDs for ripping and/or direct playback. Remote Control All features of the MAN301 are controlled via an Apple® iPad or iPad Mini. All iPad generations work. Back panel elements from left to right XLR and RCA type analog output sockets. For the SERVER version of the MAN301 the XLR sockets are missing and the RCA sockets are not connected internally. The SERVER version can be easily user-updated with the D/A Converter option. RCA type sockets for digital input and output. XLR type sockets for digital input and output. TOSLINK type socket for digital input (optical). BNC type sockets for word-sync synchronization input and output. Ethernet, USB and two Firewire 800 sockets. IEC type mains receptacle. WiFi antenna socket. External music storage The music files are stored on an external storage device, e.g. on a NAS (Network Attached Storage) or DAS (Direct Attached Storage) like e.g. a USB hard-disk. There is no internal storage available for music files. Recommendations for suitable NAS devices are supplied in the MAN301 manual. Multiple NAS units can be added for unlimited storage. Network connectivity The Ethernet socket connects to a NAS and the local network. The WiFi (WLAN) implementation in the MAN301 supports at the same time an Access Point (i.e. the iPad can connect to the MAN301 directly if preferred) and an Uplink (i.e. the MAN301 can connect to the local WiFi network). Some of the many software features of the MAN301 in a nutshell: Multiple MAN301 devices can be controlled from within a single iPad. Multiple users per MAN301 device are supported, each with his/her own music library, playlists, searches etc.. All common audio file formats (uncompressed, lossless compressed, lossy compressed) are supported for playback and ripping. Music library displayed according to album names, artist names, genres, recently played, recently added. A powerful search facility allows to store searches, which result in dynamic playlists. Playlists are easily added, edited and can be set safe. Volume control in 4 coarse analog steps and with a high resolution, dithered digital fader. Start, stop, skip controls. Repeat single track or repeat whole playlist function. Powerful cover art search in multiple databases including Gracenote and Google. CD ripping in all common audio file formats. Direct CD playback without the need to rip the CD. Metadata fetching from various databases including Gracenote. (Gracenote is the most powerful database for CD metadata and cover art). Comprehensive user interface on iPad, easily to be handled even by computer novices. Software upgradeable via Internet. Internet radio streaming. Future software upgrades will include various signal processing facilities. Power Mains voltage: 100…240 V, the mains voltage is automatically switched Fuse rating: 4 A slow blow for all mains voltages Power consumption: 50 W max. Power consumption in standby: 0.5 W max. XLR Output: 7.5 Vrms, +19.7 dBu, with a 0 dBFS sine wave input 2.3 Vrms, +9.7 dBu, with a 0 dBFS sine wave input 0.75 Vrms, −0.3 dBu, with a 0 dBFS sine wave input 0.23 Vrms, −10.3 dBu, with a 0 dBFS sine wave input These levels are achieved with all faders / gain trims set to maximum level. RCA Output: 3.75 Vrms, +13.7 dBu, with a 0 dBFS sine wave input 1.15 Vrms, +3.7 dBu, with a 0 dBFS sine wave input 0.375 Vrms, −6.3 dBu, with a 0 dBFS sine wave input 0.115 Vrms, −16.3 dBu, with a 0 dBFS sine wave input These levels are achieved with all faders / gain trims set to maximum level. Measurements (internal DAC option installed) The measurements below have been taken at the following conditions (unless noted otherwise): 1 kHz measurement frequency, maximum selectable output level, 192 kHz sampling frequency (Fs), 22 kHz measurement bandwidth, unweighted, 0 dBr equals the output level at 0 dBFS input.